Despite a positive close in Europe yesterday, momentum sagged in the US, with their indices closing significantly off their highs. 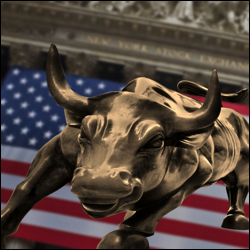 The Dow Jones only saw a modest gain of 44 points to close at 14,859 and Asian markets are currently trading mixed. Even though we have seen gains over the past two days, little has really changed to clear the uncertainty. If anything, following yesterday's US GDP upwards revision, the Fed's taper looks even more likely to begin in September. As August draws to a close, it seems that September may well live up to its historically weak reputation for equity markets. This morning, stocks are set to open modestly lower as the list of unresolved negative cues continues to mount. Markets managed to regain some composure yesterday but remain on edge. The threat of US tapering, Syria and soaring energy costs have all combined to put huge amounts of uncertainty into the heads of traders at the moment. Not to mention the fact that the US debt ceiling is creeping back into the mix. In addition, most major indices are looking to set a monthly loss for August so, given that the historically weak month of September is fast approaching, traders may be tempted into taking preventative action against further declines. With so much uncertainty hanging over the markets, it seems that only the most optimistic bulls with rose-tinted glasses are getting long right now. Despite this, following a sharp drop during the last few sessions, US investors were out bargain hunting yesterday, giving the Wall Street stock market index a chance to rebound 33 points to 14,813.5. With the worries of the taper pushed to one side, chatter in dealing rooms is all about the wider consequences of Western military action in Syria after what appeared to be a chemical attack last week. Although consensus appears to be for a precision strike, it is the potential geopolitical effect across the region that has traders heading for safe havens. Yesterday, Iran and Syria warned that any action by the West would instinctively lead to retaliation against Israel, and Israeli Prime Minister Benjamin Netanyahu suggested that they wouldn't sit around waiting to be attacked. As a result, the web of consequences of a strike continues to get more complicated and much harder for the stock markets to fathom. The uncertainty caused the Dow Jones to plunge 178 points to 14,776 yesterday, even though we saw a surprise climb in US consumer confidence for August. European equities are set to open lower this morning, tracking overnight jitters in the US and Asia. US markets managed to grind out gains for the majority of yesterday's session until US Secretary of State John Kerry said that President Obama will hold the Syrian government accountable for using chemical weapons against its own people. In an instant, US markets recoiled as trader's switched into risk off mode, with the major indices plunging and finishing in negative territory. The Dow Jones tumbled 45 points to end in the red at 14,956. The apparent certainty that military action against Syria is on its way has traders highly uncertain about what the repercussions will be for such action in an already volatile region. Naturally, traders will be shying away from risk assets until there is some clarity about the future path of military intervention from the West.